Houthi Shiite fighters chant slogans as they guard a street leading to the residence of former Yemeni President Ali Abdullah Saleh, in Sanaa, Yemen, Dec. 4, 2017. It was a bitter end for the former president who had ruled the north of Yemen and then a united north and south for nearly 34 years. His death came at the hand of Houthi militiamen who were pursuing him and a number of close aides as they attempted to flee fighting inside the capital Sanaa. Amateur video released by Houthi media show the former president with an apparent gunshot wound to the head, being carried off in a blanket. Members of his political party claimed Saleh had been killed at point-blank range, after his three-vehicle convoy was stopped by Houthi militiamen. One of his sons was also reportedly shot and taken captive by the Houthis. Arab media claimed Iranian drones detected the former president's motorcade leaving Sanaa and alerted the Houthis, who said Saleh was fleeing to territory under control of the Saudi-led coalition. He had broken with the pro-Iranian militia group on Saturday by offering to negotiate with the coalition. A Houthi Shi'ite fighter guards a street leading to the residence of former President Ali Abdullah Saleh, in Sana'a, Yemen, Dec. 4, 2017. In a televised speech Monday, Houthi leader Abdel Malek al Houthi declared victory against Saleh. He said the Houthis have put a stop to a massive plot, which represented a serious threat to the country and to its stability and security, as well as the unity of its people, by handing it over to its enemies, after they had failed to capture it in nearly three years of battle. Houthi went on to blast Saleh for betraying the loyalty of those he had worked with and claimed the ordinary people of the capital could not understand how he had changed sides after three years of denouncing the Saudi-led coalition. The rebel leader claimed many ordinary Yemenis were shocked by (Saleh's) calls for strife, combat, upsetting peace and security, and he says he tried in a fraternal and peaceful way to avoid the current conflict by talking (with Saleh). 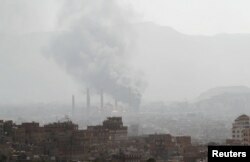 Smoke rises during a battle between forces loyal to former Yemeni President Ali Abdullah Saleh and Houthi fighters, in Sana'a, Yemen, Dec. 2, 2017. As president of Yemen, Saleh had fought the Houthis in five conflicts between 2005 and 2012, before allying with them in 2014 after the Saudi-led coalition launched a military operation to restore the internationally-recognized president, Abdrabbu Mansour Hadi, after the Houthis had deposed and arrested him. Former U.S. Diplomat David Mack, now with the Middle East Institute, told VOA Saleh was "one of the smartest political operatives in the Arab world," and the former president believed he had been unjustly driven from office by countries of the Gulf Cooperation Council, in accord with the United States. Mack told VOA, before news of Mr. Saleh's death, the former president "wanted to have one chance to restore his reputation, which has been terribly, terribly damaged during the past decade. "He has gone from having the reputation of being this supremely capable political operator within Yemen, to being somebody who was just out for personal power and was prepared to see tremendous suffering of the Yemeni people in the process," Mack said. The whereabouts of Saleh's son, and political heir, Tareq, who was leading the fight against the Houthis in the capital at the head of the Presidential Guard regiment remain unclear. The former president's supporters have suffered serious military setbacks during the past 48 hours.